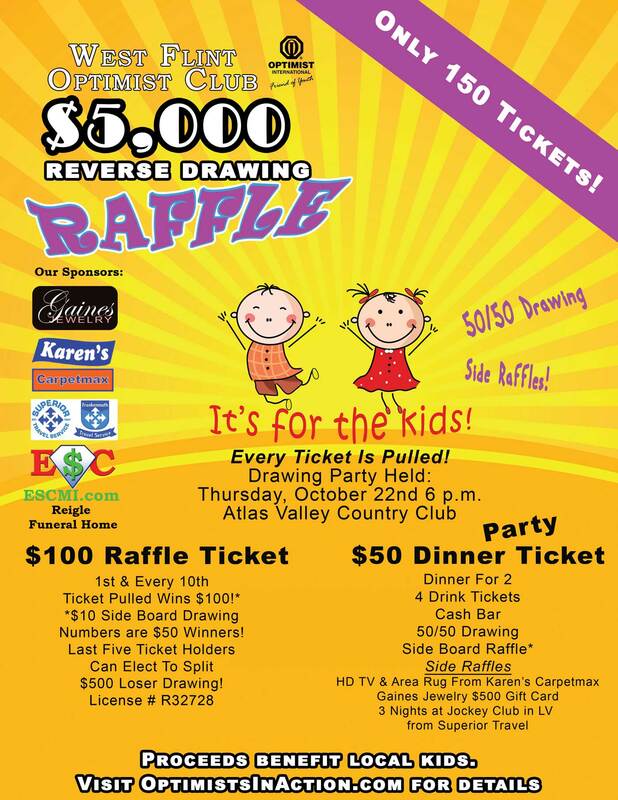 West Flint Optimist Club, the nonprofit organization devoted to supporting local children’s charities, is hosting its 29th Annual $5,000 Reverse Raffle Dinner on October 22nd at 6pm in Grand Blanc at the Atlas Valley Country Club. The cost of admission is $50 and includes Dinner for Two with 4 drinks. Only 150 raffle tickets are sold at $100 each for the grand prize of $5,000. The first ticket and every tenth ticket pulled from the barrel wins $100. Drawing continues until the last ticket drawn determines the winner of the $5,000. Suspense builds dramatically as the evening progresses. When there are only five tickets left in the drum, remaining ticket holders are invited to the stage for a secret ballot vote and can elect to split the $5,000. If anyone wants to draw, the drawing continues until there is either a unanimous decision to split or the final ticket and $5,000 winner is drawn. Lastly there is a drawing from all the losing tickets for consolation prize of $500. “Not only is this a fun event, but it raising lots of money for local children,” said Jeff Dennings, President of the West Flint Optimist Club. All raffle proceeds stay local and will go toward the charities supported by West Flint Optimist Club, which include but are not limited to Whaley Children’s Center, Special Olympics, CANUSA Games, Children’s Miracle Network, Michigan School for the Deaf, YMCA, Hurley Hospital Pediatrics, Swartz Creek Special Education, Old Newsboys of Flint, Greater Flint Boys & Girls Club, University of Michigan – Flint Scholarships and Camp for Children with Cancer. Tickets go on sale September 10th and can be reserved through Optimist Club Members, emailing JeffESCM@gmail.com or by going online at OptimistsInAction.com. Click here to download the Flyer or here to download the Press Release. West Flint Optimist Club was founded in 1963. They are a local non-profit associated with Optimist International. The club volunteers and raises money to support local charities that involve children. Optimist International is a worldwide volunteer organization made up of more than 2,500 local Clubs whose Members work each day to make the future brighter by bringing out the best in children, in their communities, and in themselves. If you would like more information about this topic, please contact Jeff Dennings at 810-429-3634 or email at JeffESCM@gmail.com.